"... an extremely handsome sable male. On this day, showed me everything I wanted to see. Topline, attitude, excellent ground covering gait, and good front reach and rear drive. Clean at both ends. Really showed his heart out and must say he was really pressed by the second place dog (Anarak's Winning Combeau). I understand that this win finished him. An excellent specimen of the Breed." "... a beautiful, deeply pigmented sable male with ground covering sidegait. 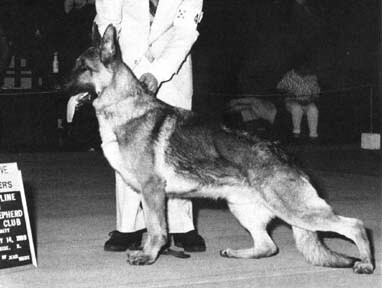 A pretty dog with a good topline, he was also Winners Dog." "... a large, sable male who I would prefer deeper in body. He has nice front extension, strong back and is also clean. He takes a good stride and appears fluid both tight or loose."